This Taylor Dreadnought pairs layered walnut back and sides with a solid spruce top, pumping out full-voiced tone that responds to strummers and flatpickers with deep lows, punchy mids, and clear treble notes. The slightly narrower 1-11/16-inch nut width makes barre chords easier on the hands, and with Taylor’s Expression System 2 onboard pickup, you can count on a reliable performance partner that produces natural amplified acoustic tone. 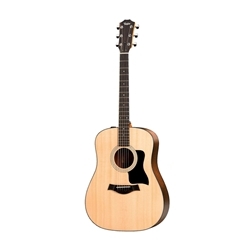 The guitar includes a lightweight yet durable Taylor gig bag to accommodate life on the go.